Star Wars icon Mark Hamill is always a regular presence on social media, where he recently used his powers for good, helping a young girl embrace her Star Wars fandom. Earlier this week, young adult author N.J. Simmonds sent out a tweet, revealing that her seven-year-old daughter was in her room crying because she wants to wear her Star Wars t-shirt to school, but was afraid her classmates would make fun of her for liking, "boy stuff." She asked for Star Wars fans to retweet and comment so she could show her daughter, "how awesome girl Star Wars fans are," and her tweet went viral, getting over 46,000 retweets and over 130,000 likes, along with a reply from Star Wars legend Mark Hamill. Here's what he had to say to Simmonds' daughter. "Just tell her to feel free to use this gesture if her classmates give her any grief. 'Boy stuff'? PLEASE! The Force is, & always will be strong with females here on Earth & in galaxies far, far away. - mh." 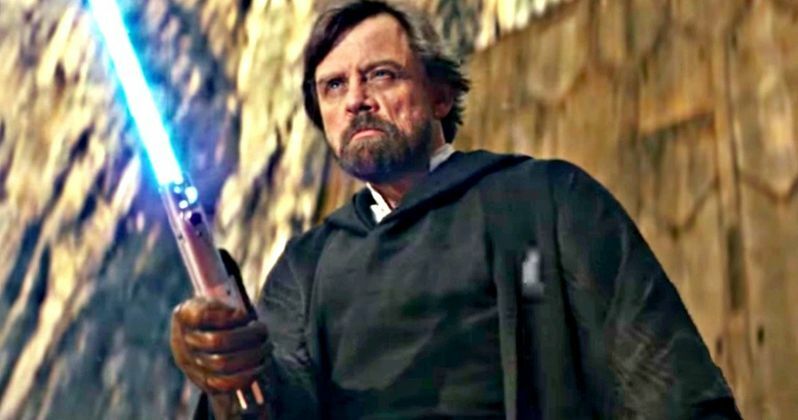 Hamill's social media shoutout included a GIF of Luke Skywalker's now-infamous moment in Star Wars: The Last Jedi, where he brushed off his shoulder. After Hamill responded, Simmonds received a number of other wonderful responses, including a woman from NASA who tweeted a photo of her driving a Mars Rover while dressed up as Rey, and another female NASA employee who said the iconic Star Wars character Princess Leia inspired her to work there. Simmonds also released a statement to the website Romper, revealing her daughter's reaction to Mark Hamill's response, while offering some context about why her daughter was so hesitant to wear her Star Wars t-shirt. "When Mark Hamill responded I showed her and she smiled, she then said 'of course he said nice things, because he's the good guy' and she ran off to play. Like any normal kid should. We live abroad and are part of a small community, so my daughter's only reference to Star Wars was the fact that she likes to watch it with her dad and a few boys at school play Star Wars games in the playground. Therefore, when she decided to wear her T-shirt to school she was nervous about what her girl friends would say as she'd never seen her friends wear Star Wars clothes (as they are always in the boy section of shops)." Simmonds would later send out a number of tweets thanking Star Wars fans for the outpouring of support, adding a message from her daughter stating, "Thank you Luke Skywalker for your message." She added that her daughter is very "sheltered from the Internet and has no idea what she started." She also added that now her daughter refuses to even take her Star Wars t-shirt off, quite the amazing reversal from just a few days ago. Simmonds has also been taking to Twitter to decline any and all interview requests, adding that after issuing her statement to Romper, there is, "nothing left to say." Take a look at all of the tweets from N.J. Simmonds and Mark Hamill's Twitter below. My 7 year old daughter's crying in bed right now because she wants to wear her Star Wars t-shirt to school but is scared her classmates will laugh because she likes 'boy stuff'. I'm so sad/angry for her. Please RT and comment so I can show her how awesome girl #StarWars fans are. She went to school smiling because of all your kind words. Her friends loved her t-shirt (of course they did). She's now home having realised that the fear of ridicule needn't be stronger than the joy of what you love. Thanks everyone! When I posted about my daughter being worried that her love of #starwars was "for boys" I had no idea how much it would struck a chord with so many women around the world. Of course she was strong anyway, she didn't need Twitter to tell her that, but this outpouring of love showed us all that strangers can come together for one cause. That love is stronger than hate (ask any Jedi) and that women can do and be anything. Our kids are growing up in..